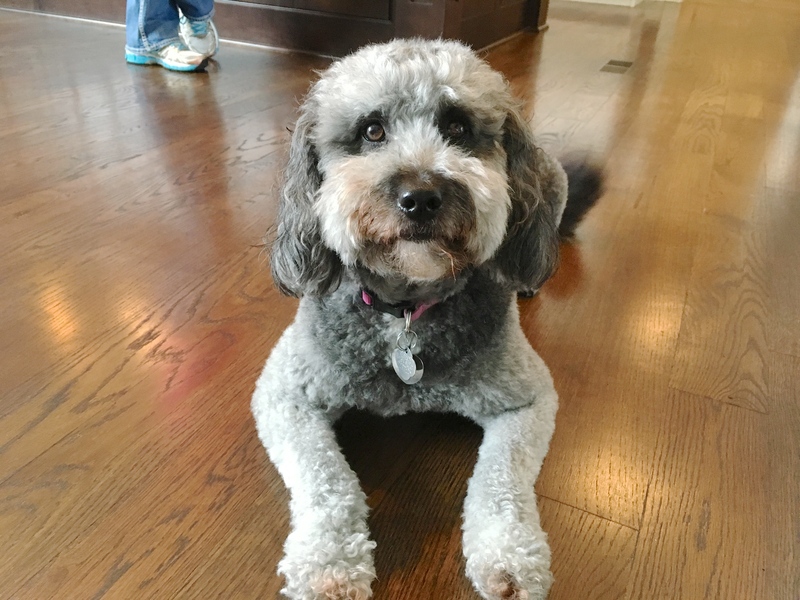 Shadow is a three-year-old Mini Golden Doodle who gets over excited when guests arrive, barks a lot, tries to run out the door, doesnt recall, licks and mouthes, is reactive when she sees other dogs and only eats when she wants to. Shadow saw me approaching the door and was barking excitedly before I even had a chance to knock. After chatting with Shadow’s guardian for a couple of minutes, if became clear to me that a lack of rules combined with rewarding Shadow without much structure had resulted in a dog that considered herself of the same authority as the humans in the home. When a dog considers itself peers with humans, then listening to the human’s commands and corrections is elective in the dog’s mind. In order to help Shadow’s guardians change the leader follower dynamic, I suggested a number of simple rules and boundaries to incorporate. Dogs go through life probing waiting to be corrected; this is how they determine what is and is not allowed. Because dogs learn through association, the timing of your corrections is as important as establishing a rule itself. If your correction is too late, the dog doesn’t associate it with breaking the actual rule. So when we incorporate rules and boundaries, and then correct or disagree a dog the instant that it breaks them, we help communicate to the dog what we actually want. In the course of going over some suggested rules for Shadow, her guardian mentioned that the dog had developed a rather unusual habit of going to the door, then when the guardian opened the door running around the room to pick out a toy, drop it on the floor, then expect the human to come over to pick up the toy and go back to the door – tossing it out for the dog to chase. Needless to say, this is a rather cumbersome interaction with their dog and also underscored the dog’s perception that it has the authority to tell it’s humans what to do. I spent a few minutes going over a couple of rules as well as how they can stop Shadow’s unusual door toy activity demand. Shortly after we wrapped up the segment on rules and structure, I noticed Shadow nudging her guardian for attention. As you can see in the below video, Shadow was not very subtle in her request. And while even though it was done in a cute way, the dog is essentially telling the human what to do. If the human complies consistently, they send a message that the dog has the authority to tell the humans what to do. To help Shadow’s guardian break this habit while also developing a healthier leader follower dynamic, I went over a technique that I have developed called Petting with a purpose. While positive reinforcement is a great motivator for dogs, sometimes we need to communicate that we disagree with the dog’s actions or behaviors. I spent the next few minutes going over a set of escalating consequences that I like to incorporate any time a dog fails to listen or breaks a rule. We put these escalating consequences to a real-world application a few minutes later when the families father arrived for the session. Because Shadow liked to rush the door, get excited and occasionally dash through it, I wanted to show the guardians how they could teach the dog to stay several feet away from the door on her own. This exercise was a little bit more challenging than it normally is for me as the families gorgeous home incorporates an open floor plan that gave the dog multiple paths to get to the door. I suggested that the family call and text one another when they’re on their way home so they can practice this exercise amongst themselves. If Shadow starts to continually pick a different route to go around the person in order to get to the door, they may have to block access to the alternative route temporarily. If the family practices this exercise a half dozen times or so, Shadow should start going to the edge of the carpet and waiting for the humans to answer the door without her. Now that we had gone over new techniques, structure and exercises that will help the dog develop self-control and respect for her humans, I wanted to tackle her leash reactivity. Shadow’s guardians mentioned that any time that they were walking the dog and she saw another dog, she started to get very anxious and excited; possibly even aggressive. We call this behavior Leash Aggression and fortunately someone who I look up to as a dog behaviorist has written a book that details a technique to curb this behavior. I spent the next few minutes going over this technique with Shadow’s guardian. It will be important for Shadow’s guardian to practice this Watch exercise multiple times a day over the next week or two (while gradually adding in distractions) to fully develop her ability to immediately turn her attention away and look at her human instead of looking and reacting to an approaching dog. At first they will need to practice this technique inside the home with no distractions. Once the dog is reliable under those situations, they can start gradually increasing distractions around her such as children running by or playing, the television being on, being outside on the deck, outside on walks without any dogs and eventually when dogs are around but at a great distance. As Shadow becomes accustomed to looking to her guardian when given the command, she will be able to eventually do that on her own when se see’s an approaching dog. By the end of the session, Shadow was already starting to adapt to the new techniques and exercises. It’s going to take her guardians a couple of days to get used to Petting with a purpose and a regular routine of practicing these different techniques and exercises. The more they practice them, the faster the dog will come around. Because the dog has such a clear desire to make her humans happy, I suspect that they will be able to put most of her unwanted behaviors to bed very soon.